I’m seeing a number of these rugs coming to market. I refer to them as shaggy leather rugs. Rug made of leather strips. 1) Pets LOVE these. And there is a tendency to have pet puddles on them as a result. 2) Many have SIZING on them to make the strips of leather “stiff” – and this sizing is not permanent. 3) The colorful strips (reds, blues, and blacks typically) can bleed when given a wet wash. Test for this. So, if you do happen to have pets in the home, or the rug gets fairly dirty, you will need to get the piece washed to become clean again. This means the strips will likely become limper, and the overall rug not as “peppy” as when you first bought it. If the rug does not have heavy soil because it is vacuumed regularly (on this type of tied-together strip construction, do not use a regular vacuum, I’d suggest a canister vacuum) – then a professional cleaner may opt to actually clean those strips of leather by hand with leather cleaning products. This hand work will take a very long time, and would have a sizeable cost because of that labor. This helps release grit, dust, and fuzzies that have lodged into the base of this rug, and will pep up the leather strips for a short time. These rugs are kind of cool though. I would not use them in a high traffic area. And, if I had pets, I’d probably not opt for this choice. The rugs are pricey to begin with, and having to wash it frequently because of pet accidents or dander odor, would make it an even pricier investment. Just a few things to know before you buy one… or before you decide to clean one. Bugs – Do Not Eat My Rugs! Moths and carpet beetles like to munch on wool rugs. But they are not the only culprits. If you do not keep your rugs clean, and there are food spills, or drink spills, you can attract insects who are eating the “food” but also the wool that has absorbed it. Like a shish-kabob for bugs! 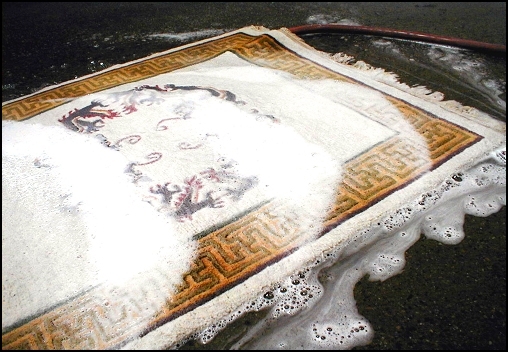 Since many rugs have a COTTON foundation, which these bugs do not eat, most moth or carpet beetle damage will look like this – empty spaces of white cotton foundation threads peeking out at you. 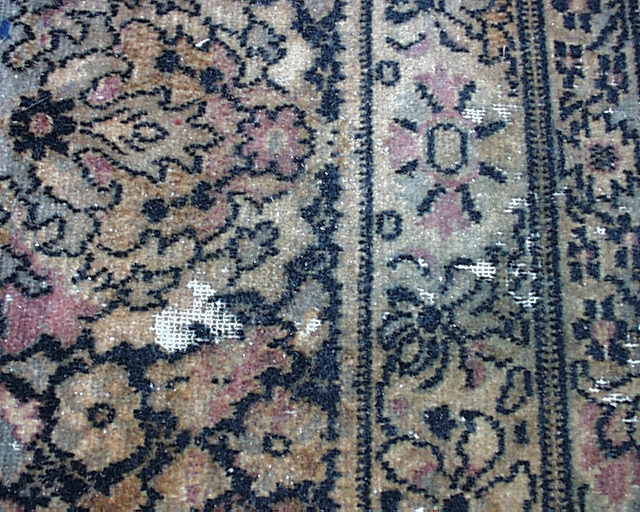 Areas of a Wilton rug where the wool has been eaten away. Wool-munching bugs like dark areas without much air circulation. This means you will tend to find their “activity” on the underside of a rug, or behind a large drape, or under a sofa, or on the backside of a textile hanging up on a wall. It is important, especially if a rug has been in place for 6 months or longer without much activity to make sure that bugs are not making a feast of your rug. When you are vacuuming a rug (ideally with a canister vacuum – little abrasion so you can do it weekly), be sure to flip over the corners and sides and run the vacuum head over the edges to pick up any LINT that may actually be larvae. Moth eggs do sometimes resemble sticky lint, so you want to keep an eye out. By creating air flow under the rug, and moving it around, you can dissuade bugs from making a home there. You can also set smaller rugs out in the sunlight (face down) for a half hour to hour while you are cleaning the underneath flooring. This open air and sun will also make unwanted bugs get the heck out of Dodge and move to the next home. Pulling down hanging rugs and vacuuming the back of the rug is very important, especially if you have tribal pieces such as American Indian weavings. These pieces tend to have “tastier” unprocessed wool for bugs, and with some (such as pieces from Morocco), there can be wool that has not had as thorough a cleaning process before being exported and so they may have carried over some of their own indigenous insects. Wool is an incredible fiber. It is strong, it is dyed vibrantly, it is incredibly environmentally friendly because it is a renewable resource. People love wool … and unfortunately so do bugs. Wool is also an AMAZING filter for the air because it can grab and hold dust and grit, pounds of it, and still look clean. When you wait to clean your wool rug when it looks dirty, you are already months behind the ideal time, and that packed in grit causes abrasion that makes your rugs wear down. Think of a tiny rock in your shoe, how the tiniest one can drive you nuts. Now think of thousands of tiny little rocks rolling in those wool fibers that you are walking on – that is why rugs can wear down over years of misuse. Wool rugs can last for CENTURIES under the right conditions – which includes regular dusting (vacuuming) and washing. And your best protection against BUGS? 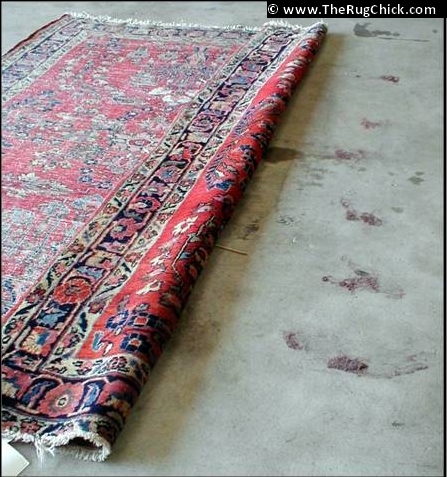 Have your rugs regularly cleaned. This not only makes your home environment cleaner, but removes unwanted guests in your wool fibers before they begin causing real damage, AND removes the grit that causes rugs to wear down sooner than they should. By having the rug sent out for a bath, you can thoroughly clean the rug and have it come back residue – and bug – free. You can apply “chemicals” to try to mothproof the piece, but these are poisons, and are only appropriate if you are packing the rug away for years in storage. An insect repellant is a safer choice, if you must have something applied because your home is prone to moths and carpet beetles. The safest option of course is to simply clean the rugs regularly, and vacuum them regularly, which is better for you, your family, and your home anyway. And… no chemicals you have to worry about your kids and pets crawling over. I like residue free … it just makes life cleaner and simpler.